Students at Nanaimo’s Nisaika Kum’Tuks Elementary Centre no longer have to go far to find a good book. 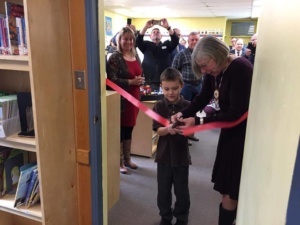 The public school celebrated the official opening of its first library Tuesday with Lt.-Gov. Judith Guichon. It’s a new chapter for the centre and its 30 students, who previously walked to the public library for books. Now, iPads, computers, video conferencing and children’s and adults’ books are at the fingertips of students and their families, thanks to Write to Read B.C., a partnership between indigenous communities, Rotarians and Government House to help with graduation rates and improve literacy and access to libraries.